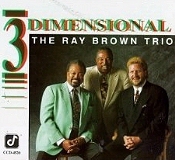 Gene Harris, piano; Ray Brown, bass; Jeff Hamilton, drums. Ray Brown is a man of many images, a wearer of several hats. Though his primary identification remains that of a nonpareil bassist, he has also established himself as a composer (his "Gravy Waltz" won a Grammy award), an entrepreneur and a talent scout. In this last capacity we owe him a special debt for his major role in bringing Gene Harris, surely one of the most exciting blues-oriented pianists around, out of semi-obscurity in Idaho. He had a steady job in Boise until Ray began luring him away for a series of jobs that culminated, in 1987, in his triumphant Tribute to Count Basie all star big band session (Concord Jazz CJ-337). Carl Jefferson, of course, was the other key figure in the Brown-Harris alliance. 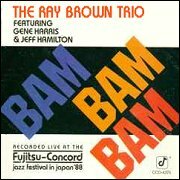 Late in 1988 Ray, Gene and the redoubtable young drummer Jeff Hamilton were on tour in Japan, playing ten concerts of their own in addition to taking part in Jefferson's Concord Festival unit. During that time, this session took place before an audience that was exceptionally enthusiastic (needless to say, none of those applause sounds had to be amplified). "The Kan-i Hoken Hall is a big auditorium," Brown recalls, "around 2,000 people, and we really had them with us all the way. This was one of those nights when everything came together." The Brown original now known as "F.S.R." (For Sonny Rollins) began as a rehearsal of Rollins' own "Doxy" on a record date with Milt Jackson. "Then," Ray says, "I wrote this other theme as a sort of pre-chorus for 'Doxy,' and it came off so well that I thought, why not make a separate tune out of it?" The basis is a 16-bar chord pattern that goes back decades before either Brown or Rollins. "Put Your Little Foot Right Out" is a simple piece based on just two chords (tonic and dominant), probably of traditional origin, but best known in jazz circles through Miles Davis's recording, then under the title "Fran-Dance." Note Gene's subtle behind-the-beat tactics, the perfect time and creative force of Ray's solo, and the agreeably subdued ending. "Rio" is one of a group of songs sent to Brown by the late Victor Feldman. "I liked a lot of Victor's tunes," Ray says, "particularly one called 'The Haunted Ballroom' and this one, which was new to me." Rio moves from a bluesy vamp into a fast, samba-esque theme in F Minor, with Gene displaying mighty chops, Jeff and Ray trading ideas, and Jeff soloing with the discretion that has earmarked him as the most tasteful drummer of his generation (at 35, he has been in steady demand since the late 1970s, when he worked with Monty Alexander and Woody Herman). "If I Loved You" is a 1945 Richard Rodgers melody, serving here an ideal vehicle for Ray Brown's arco bass. The spotlight then switches to Gene Harris for a version of "Summertime" that was embellished with enough breaks, blues moments and other touches to assure that this would suggest a funky, humid summer. "Days of Wine and Roses" finds the men playing this 1962 Mancini standard in what Ray aptly calls a scaled down big band style. Dizzy Gillespie's imperishable "Night in Tunisia" undergoes a transmogrification here. "I designed it," Ray says, "mainly as a vehicle for Jeff, for a marvelous hand drumming exhibition. We kept going back and forth, around rather than on the melody." "Bam Bam Bam" [mp3] is a blues, with Jeff's introduction suggesting the title. Gene and Ray have long been masters of the blues; certainly neither of them can recall how many blues they have recorded over the years, but it may well average out at one to a session. Again you will be transported by the phenomenal togetherness of this unit; essentially it's three minds that think as one. 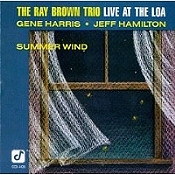 During the past two years it has been my good fortune to hear Brown, Harris and Hamilton, both as a trio and in various other configurations, at the Loa Club, a Santa Monica rendezvous in which Ray was an active partner. With the release of this album, observers around and beyond this country will be able to share the exultant joy conveyed by what must be one of the most naturally compatible threesomes ever to go public with their creative impulses.